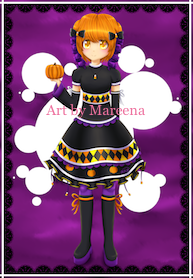 This Anime style Halloween drawing demonstrates Mareena’s talent versatility by depicting her ability to create dark art in addition to her more cheerful straightforward pieces. She takes pride in dabbling in mysterious pieces such as this Halloween Girl in Candy Corn Dress now and again. The Anime girl in this piece has large pumpkin colored eyes to match her hair and trimming on her adorable black dress. The dress is meticulously adorned with diamonds, pumpkins, lace, ribbons and a curly hem. She wears white ribboned armlets that reach from wrist to biceps. Her black length leggings stop just below the knee and are accented with orange ribbon tied into bows. She wears dark platform shoes with purple soles. In her right palm, Halloween Girl holds a small pumpkin even as she mysteriously keeps the other hand behind the bell of her dress. Mareena drew this piece during Halloween time in 2013. A close look reveals the pumpkin shaped hair style has a few strands sticking up in the shape of a stem.